I love baking and nothing is as rewarding as homemade bread. The yeasty aroma of dough proving, followed by the smell of fresh bread baking, never grows old. 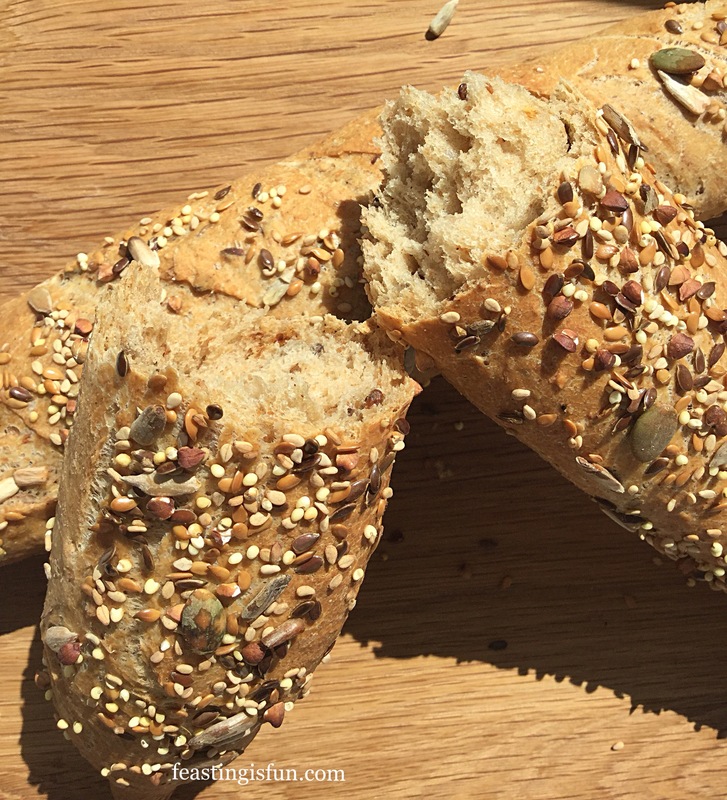 These Seeded Multigrain Baguettes are crunchy and full of nutty flavour. 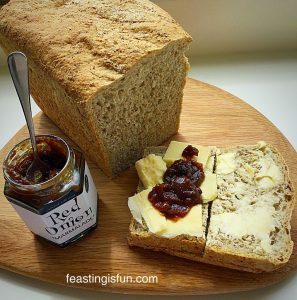 Perfect for dunking into a big bowl of soup, or filling with mature cheddar for a satisfying lunch. 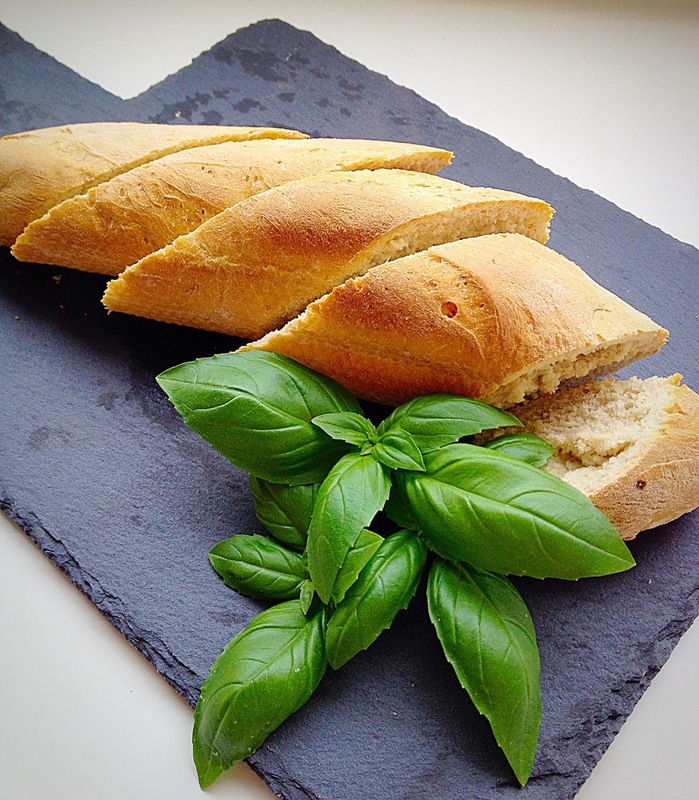 Since some people are scared about baking bread, here are a few tips to ensure great results. I always use great quality, fresh, bread flour. Also I throw away any opened flour that has been sitting in the cupboard for over 6 months. Likewise, the same for yeast. Fresh yeast only lasts a few days in the fridge. Whereas dried yeast lasts longer, yet, still should be replaced after 6 months. 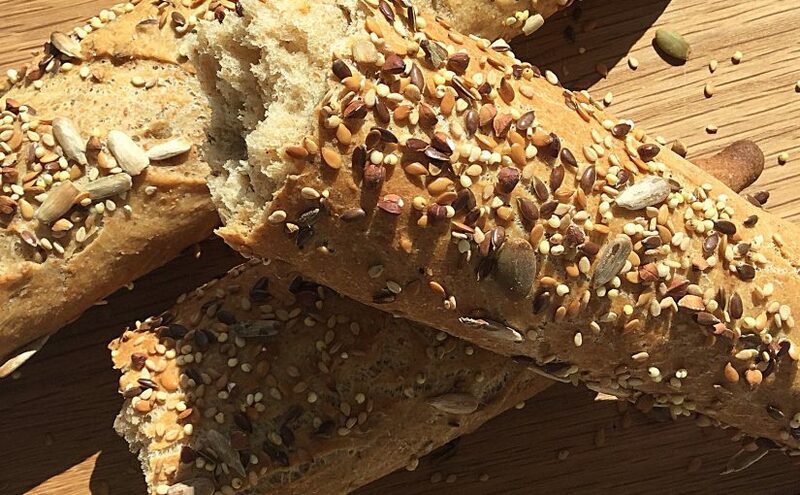 Finally, by baking bread regularly, ingredients are used up and naturally replaced before losing their freshness. 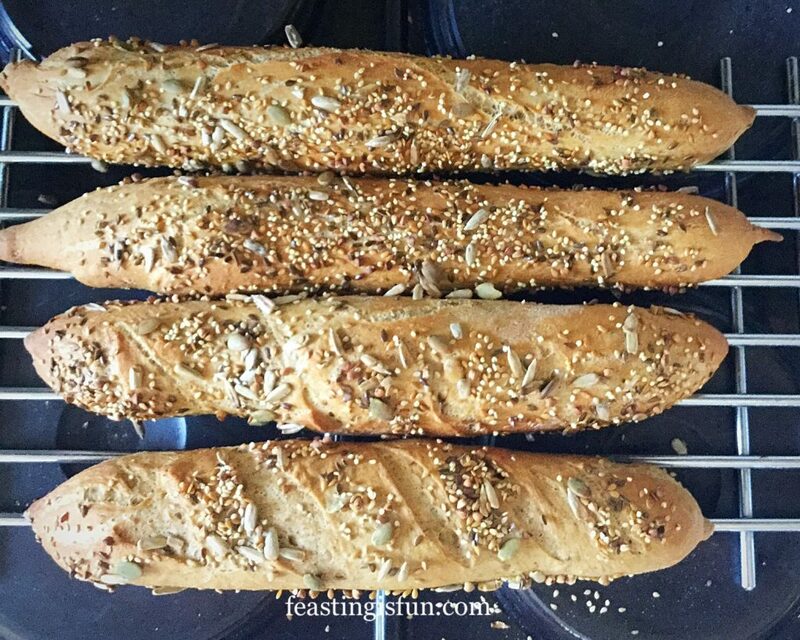 Seeded Multigrain Baguettes delicious with soup. With bread, in its many forms; loaf, baguette, rolls etc. being so readily available in every supermarket, questions may be asked about baking baguettes at home. My personal reason is the same for everything that is cooked and baked in our kitchen. Every single ingredient is known. No additives, flavour enhancers, mould inhibitors or such are added. Each baguette, or loaf is made when required, negating the need to ensure that it stays fresh for an entire week. 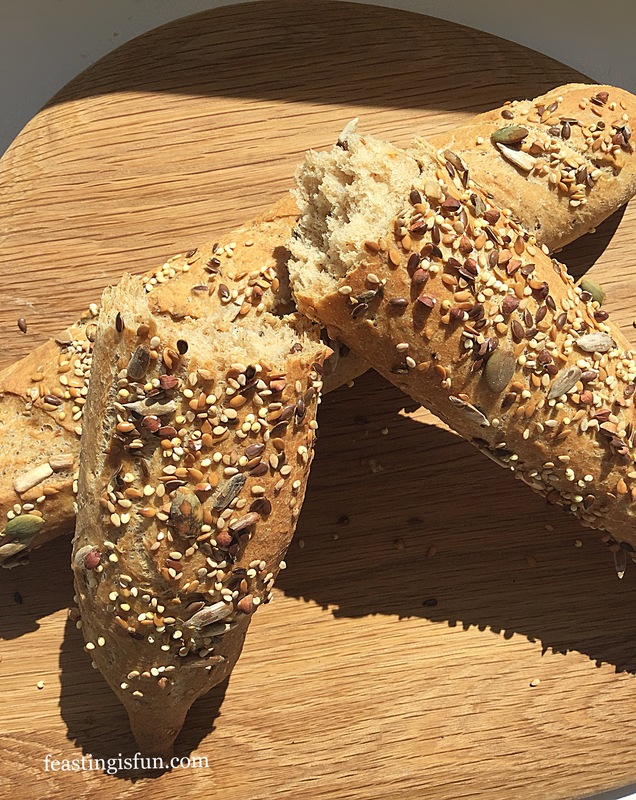 Seeded Multigrain Baguettes no artificial additives. Satisfaction gained from making, shaping and baking bread dough is reward enough for me. Because superior flavour and freshness cannot be beaten. Eaten within 30 minutes of cooling, from the oven, sets homemade baguettes apart from their mass produced counterparts. Also no ‘invisible’ nasties enter the digestive system from supposedly ‘healthy’ food. This method uses a stand mixer to mix and knead the dough. You may easily mix and knead by hand, following the shaping technique given. Place the stand mixer bowl on top of digital scales. Weighing ingredients, including water is, by far, the most accurate way to bake. Weigh 340g water into the bowl. One gram equals one millilitre of water. Add the bread flours on top of the yeasted water. Keeping the yeast and salt separate allows the yeast to work without the salt killing it. Weigh the salt and butter directly on to the flour. With a dough hook attached mix on a low speed for 5 minutes. Increase the speed to medium and continue to mix for a further 5 minutes. As soon as the mixing time has finished switch off the stand mixer. Remove a small piece of dough and stretch it. When fully kneaded the dough should stretch without tearing, so that light can been seen through it – windowpane test. Continue to mix on medium speed for a further 2 minutes, until this test is passed. As soon as the dough is fully kneaded, switch off the mixer and scrape any dough from the dough hook into the bowl, using your fingers. Cover the bowl with a clean tea towel and leave to prove until doubled in size, 1-2 hours. When the dough has doubled in size, turn out on to a lightly floured worktop. Make sure the top of the dough in the bowl is in contact with the worktop, becoming the underneath. Dividing the dough into four equal portions. 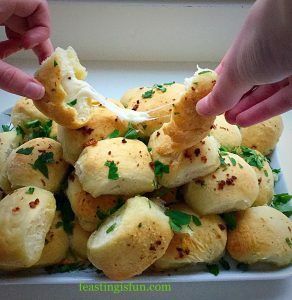 Pull out the dough 5-6 times, from the side and press into the centre of the dough ball. 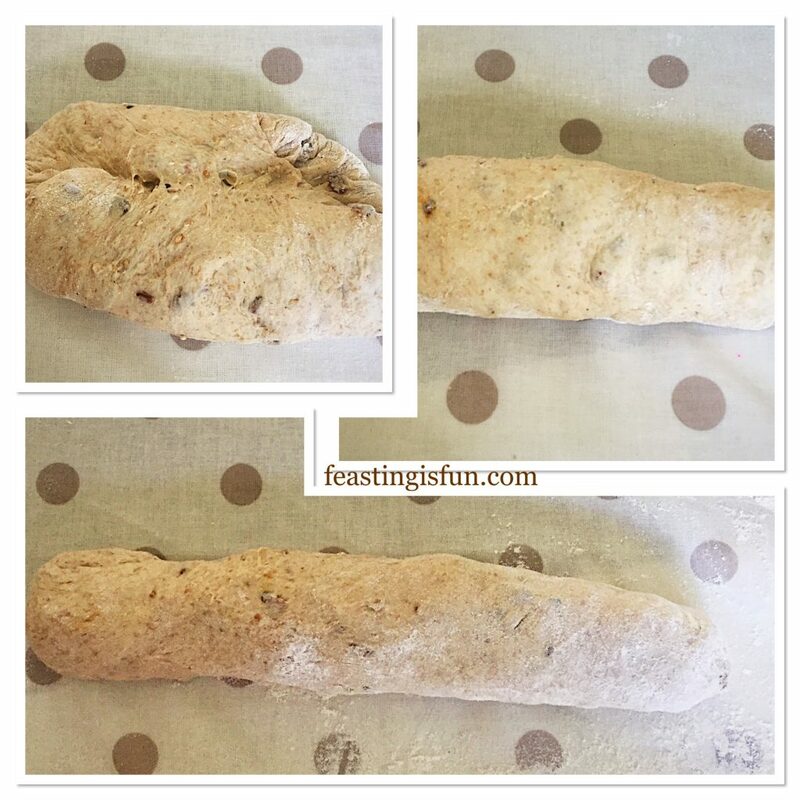 Turn the dough over, shape into a rough log and cut into 4 even portions. Take the first piece of dough, turn on its side and pull 4-5 times from around the edge. Sticking each piece of dough back into the centre as before. Shaping each piece of dough into a baguette. Start to roll the dough into a log shape. Beginning at the front edge, use your thumb to roll the dough, as in top left picture above. With the seam underneath place your hands in the centre of the log and start to roll the dough, gently easing it from the centre. Continue rolling the dough until it is 10″/25cm. Finally roll either end to a point. Place on to a baking tray or a perforated baguette baking tray. 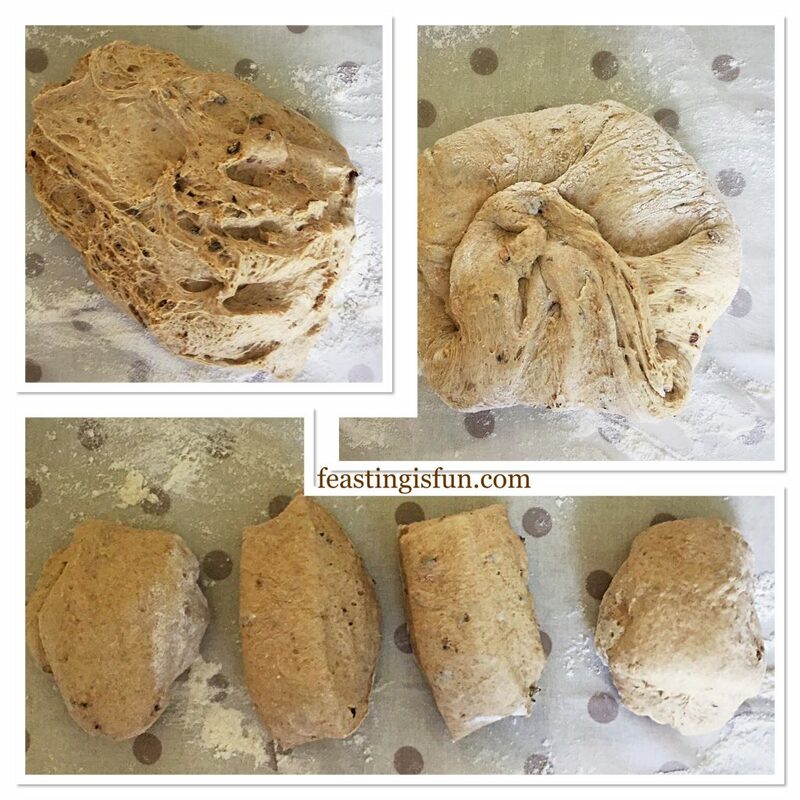 Shape the remaining pieces of dough in the same way. Cover with a damp tea towel. Leave to prove until doubled in size. While the baguettes are proving preheat the oven to its hottest setting. Place a pan of water in the base of the oven. Once doubled in size spray, or lightly brush each baguettes with water. Sprinkle over the mixed seeds. 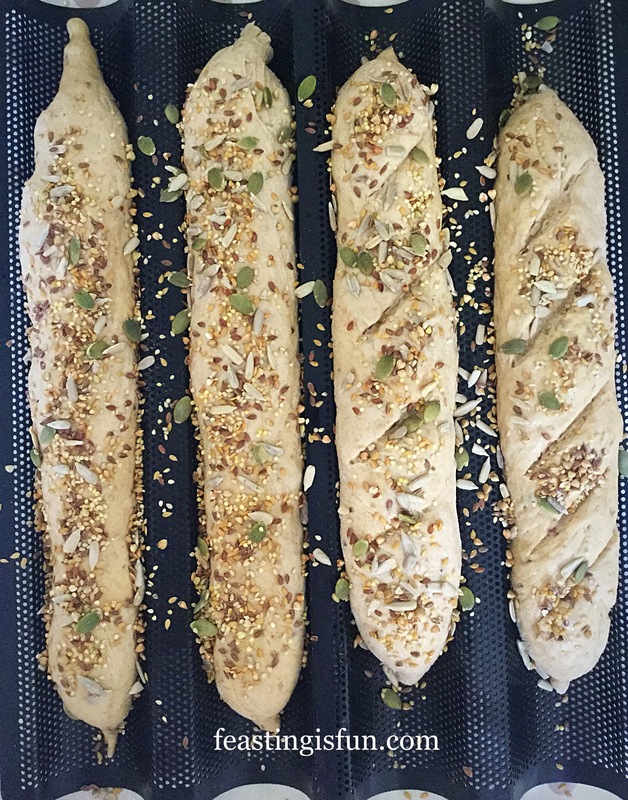 Seeded Multigrain Baguettes ready to be baked. Reduce the oven temperature to 230C/210C fan, gas mark 8. 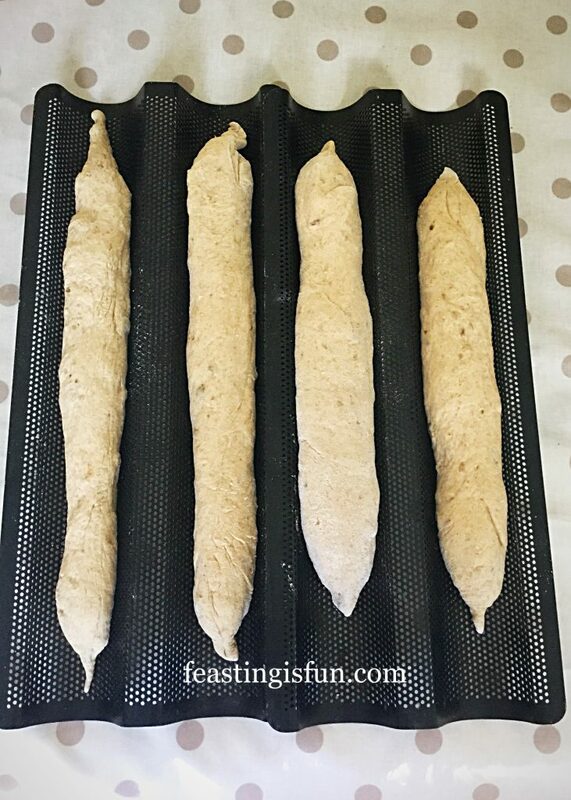 Place the baguettes on their trays into the oven. The baguette baking trays fit in at an angle. Bake for 20 minutes. The baguettes will be golden and sound hollow when rapped with a knuckle when fully baked. As soon as they are baked remove from the oven and carefully transfer to a cooling rack. Seeded Multigrain Baguettes Hot from the oven. Leave to cool until just warm. 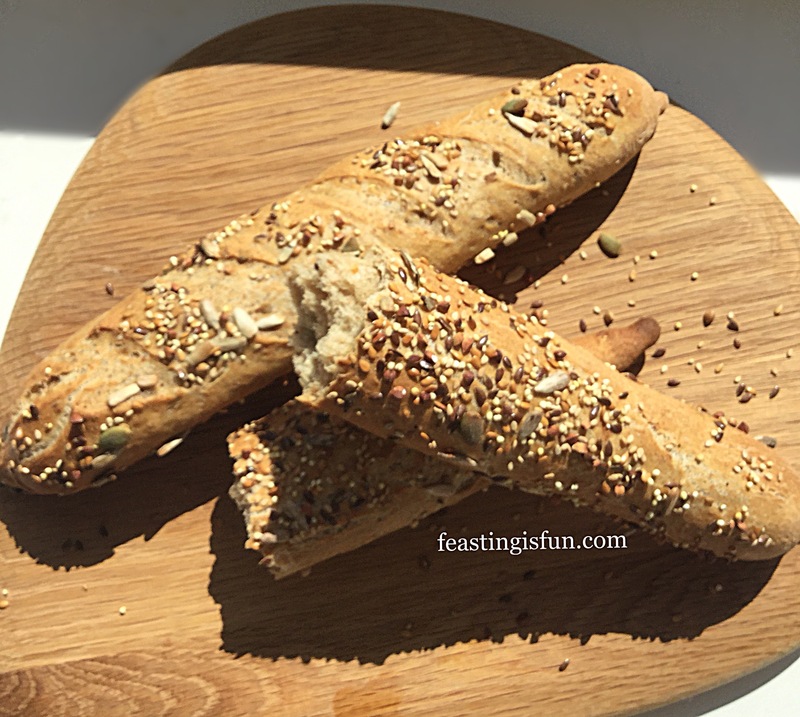 Seeded Multigrain Baguettes made at home. Serve filled with your favourite sandwich fillings, or break apart and dunk in soup. 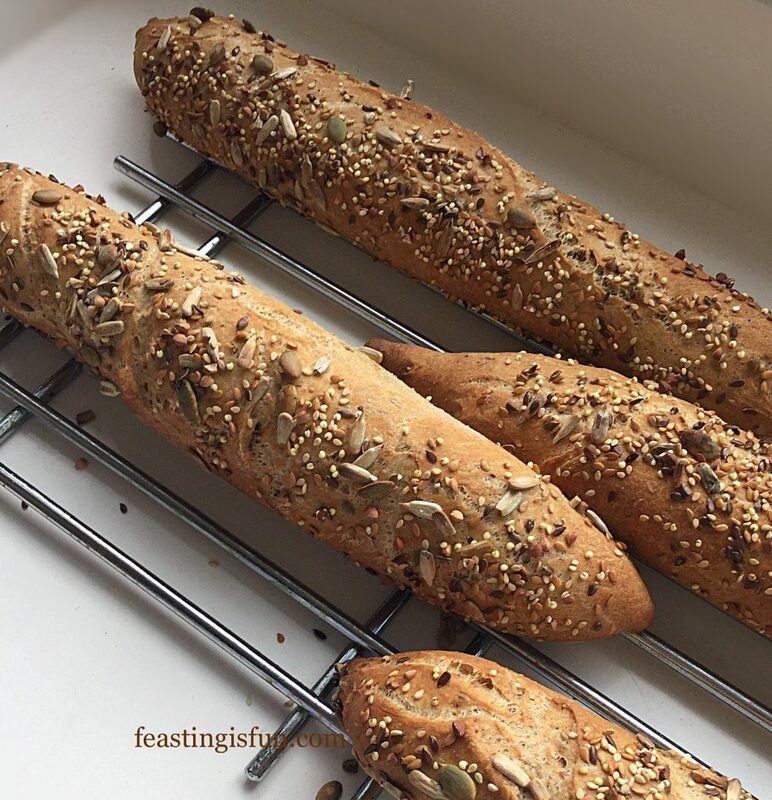 Enjoy these baguettes on the day they are made, or alternatively, freeze wrapped in aluminium foil, for up to one month. Making bread at home is so much fun. Including children in the process is almost foolproof. Dough is a great medium to play with. Especially with children, who, in my experience, are much more likely to eat what they have made. Pizzas are another big hit. It is amazing how a piece of green bell pepper can become a light sabre. This Better Than Takeout Pizza is a great recipe to try. Whatever you are making, baking and creating in your kitchens, have fun enjoying your feast. Please do not copy any part of this post. All content is covered by copyright laws. For further details see my Disclosure Policy. Hey sammie! I made this lovely recipe! It was fun making them in my kitchen! This recipe is fantastic! Multigran is so yummy!